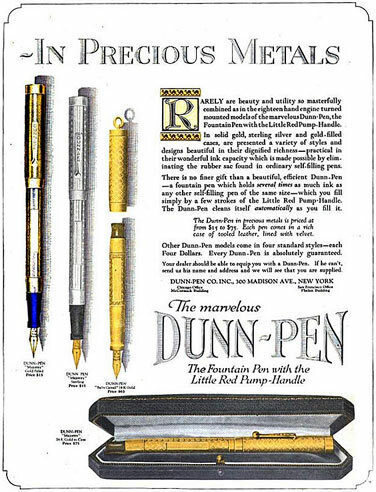 The Dunn-Pen Company set its sights high. Based in New York City, it produced a line of high-quality pump-fillers and backed them up with an extensive advertising campaign. As it turned out, however, the company lasted only a few years. Pen production began in 1921, but Dunn-Pen collapsed in May 1924. A group of bondholders bought the assets of the bankrupt company at auction and resumed production in July 1924 as Dunn Pen and Pencil, Inc., but the reorganized firm does not appear to have lasted long, with no mentions in New York area newspapers or stationery trade journals after 1925. While collector lore has it that the company failed due to a prolonged strike by its workers, extensive research has found no evidence to support this tale. This absence is particularly telling, in that Dunn's bankruptcy hearings were extensively covered in New York area newspapers -- in no small part due to Kermit Roosevelt, Theodore Roosevelt's son, having served as a Dunn director. Advertised as "the pen with the red pump handle", Dunns are filled by unscrewing the end knob (not required on earlier models with unthreaded knobs) then pumping up and down a few times. Ink capacity was high and the mechanism strong and reliable, with no soft rubber parts and only one easily-replaced cork seal at the end of the barrel. 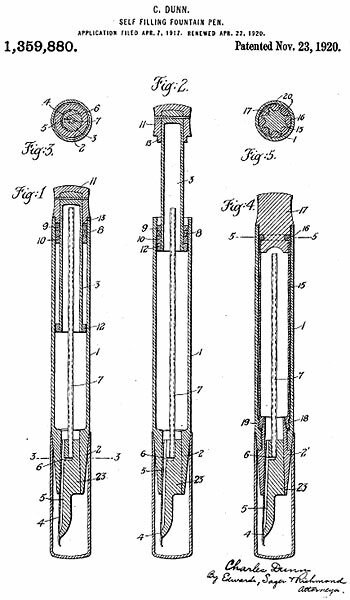 The pen was the invention of Charles Dunn, who received US patent 1359880 for his design on November 23, 1920. Tragically, Dunn succumbed to tuberculosis the week his pen was introduced (Printer’s Ink, vol. 115, Apr 21, 1921, p. 19). A filling system identical to the Dunn's was adopted by OMAS a decade later for their Lucens and Extra Lucens pens. Dunns were originally offered in just four sizes, all priced at $4, but before long there were models from the #1-size ringtop "Humming Bird" to a giant a full 8.5 inches/21.5 cm long carrying a huge ventless #12 nib. Although these giants are often called "Dreadnaughts" or "Super Dreadnaughts" by collectors, Dunn actually called them "Tanks" (Geyer's Stationer, Sep 1, 1921, p. 16). The Dreadnaughts were another line entirely, and were made in a wide range of sizes, down to small ringtops (an example is shown towards the bottom of the page). Earlier Dunns came with orange hard rubber pump handles, while later models have handles of translucent red casein. This change took place before Dunn-Pen was succeeded by Dunn Pen and Pencil in 1924. Still later, a metal crosspin was added. The hard rubber handles do not screw into the barrel, while the casein handles incorporate threads which offered more security against accidental movement of the pump mechanism. Unfortunately, the casein handles have proven to be the more fragile, and are often found cracked, chipped, and stained. Quite a few Dunns were made with transparent barrels; early ones are of Bakelite but most are of celluloid. As a whole, Dunns are not flashy pens; basic black is the rule, and though metal overlays were advertised -- the ad below is from the back page of Colliers, Dec 10, 1921 -- surviving examples are rare. Dunn also offered a line of metal injector pencils using the patents of inventor William T. Maloney. The design was advertised as "The Machine Gun of Propelling Pencils", emphasizing that it automatically loaded lead from its internal magazine. The Dunn pencil closely resembles contemporary pencils sold under the Selfeed name, but what connection there may be between the two brands remains to be determined. The Maloney patents are US 1742711 and US 1846604, registered also in Canada (258190), Great Britain (233261), and France (589669), with all three foreign registrations assigned to Dunn Pen and Pencil. Dunn's "Dreadnaught" line was distinguished by a special two-piece cap, as shown above. When the top portion is unscrewed, the nib is exposed, surrounded by a protective cage. This permits the pen to be filled without risk of striking the nib on the bottom of the inkwell or bottle while pumping -- not a trivial concern, since operation of the plunger does take some pressure. This feature is covered by George H. Doyle's US patent 1596722, filed on Mar 10, 1922 and issued Aug 17, 1926. It is found only on later-production Dunns with caps and barrels of celluloid rather than hard rubber. Original instruction sheets demonstrate the use of this cap.